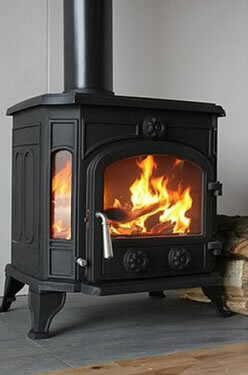 Wood Burner/Multifuel Stove Installation . We are HETAS registered which means we are fully qualified and fully insured to install safely your wood burner/multifuel stove. Many people do not realise that wood burners must comply with building regulations and, as HETAS Installers, we are able to do this without the need for you contacting your local council to obtain official sign off on your burner and save you money. We are also able to provide you with a certificate that is acceptable for your insurance company. Our service provides a free survey and quotation based entirely on your requirements and we can recommend and supply a wood burner/multifuel stove, or you can purchase your own. To view HETAS recommended appliances click here – HETAS Approved Appliances. As of October 1st 2010 it is now compulsory to have a carbon monoxide alarm, which we will supply for your piece of mind and safety. We can carry out the entire works from start to finish for you. Chop out the existing fireplace, re-point the brickwork or give a smooth plaster finish to the inside of your fireplace, safely fit your flue liners into your chimney, build a hearth if required and carry out any other work required so that you can fully enjoy your new wood burner. If you don’t have a chimney, no problem we can fit a Twin Wall system for you. The Clean Air Act sets out fuel-burning restrictions in certain locations, so before buying your own wood burning/multifuel stove you should check if you live in a smoke control area. If you do, you’ll only be able to use an appliance exempt from the restrictions [DEFRA]. Check with your local authority if your area is affected. After sales support is just as essential, so if any problems occur in the future, you can contact us and we will be happy to help. As a member of the Institute of Chimney Sweeps, we are also able to provide a full chimney sweeping service, which is essential to ensure the safely and life of your wood burner.